Grace Christian Homeschool: The Homeschool Planner Review and Giveaways! As you know I LOVE to plan - the follow through is a whole different story but I'm working on that! I've tried many planners and found that for me - the simplest seems to work the best. I also like pulling pages from different planners because let's face it - not every planner will fit your every need perfectly! Or is that just me?? The Homeschool Planner is a simple streamlined printable planner that I have used to print off the pages I need and begin to plan our fall homeschool lessons. I started with the lesson planner and wrote in our Sonlight reading plans, math lessons, and Classcial Conversations ideas for history and science. There is also a spot for supplies needed for the week so I added in what we will need for My Father's World there. We are combining lots of curriculum this year so I know I'd need it all in one place or else it will fall by the way side. My favorite of all the forms so far would be the attendance record keeper. It is broken down by month, week, and day! I really like checking off what days we are in attendance so I can see a pattern and try to plan accordingly for the next year. Also included in the original download of The Homeschool Planner are forms for a Cover page, Art Project Planner, Attendance Record Keeper, Book Report Worksheet, Field Trip Planner, Project Planner, Science Experiment Planner, Scripture Verse Planner, Student Project Notes Worksheet, and Thematic Unit Planner. The planner also includes a lifetime unlimited access to a special members area where forms are being adding on a weekly – sometimes daily – basis. I love this - she is also taking suggestions for forms. You can pick and choose what to print, how much to print, etc. You can get a free sample just for sharing about their website on either Twitter or Facebook! One more thing to note is Heather is working to make the forms editable! Oh yeah!! The best part about The Homeschool Planner is the cost! To start planning today all you need is $4.97 and you can print it again year after year! 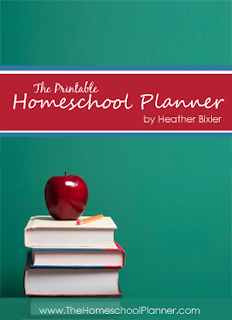 Heather has been so kind as to allow me to giveaway 5 copies of The Homeschool Planner!! To enter please be sure to follow "Grace Christian School" and then leave me a comment letting me know you did. I will also need an email address to get in touch with you! Simple enough? GO! Contest ends June 19th! I will have my children draw numbers for the winners after I return from summer camp next week so on June 20th we will announce the winners! tracieortaliz@yahoo.com I need to be more organized! I would really like to win as I am just beginning and this would be so helpful! And I am now following!! would love to win the planner! Hope your camp time was FUN and blessed! I need some sort of planner so badly. Newbie homeshooler and I have my materials ready but no plan put into place yet. kbalman@gmail.com I follow you! Following you via email...hope you have a wonderful, blessed time at camp! Winners have been sent an email to notify them! Congratulations Lisa Gonzales, Kathy Balman, Sarah Day, Amy Goins, and Tracie Ortaliz! Enjoy your planner! !